M. Boeff, H. u. Hassan, A. Hartmaier. Schematic diagram of the algorithm for the estimation of the lifetime for fatigue crack initiation. Fatigue is an important mechanism for the failure of components in many engineering applications and a significant proportion of the fatigue life is spent in the crack initiation phase. Although a large number of research work addresses fatigue life and fatigue crack growth, the problem of modeling crack initiation remains a major challenge in the scientific and engineering community. In the present work, a micromechanical model is developed and applied to study fatigue crack initiation. In particular, the effect of different hardening mechanisms on fatigue crack initiation is investigated. 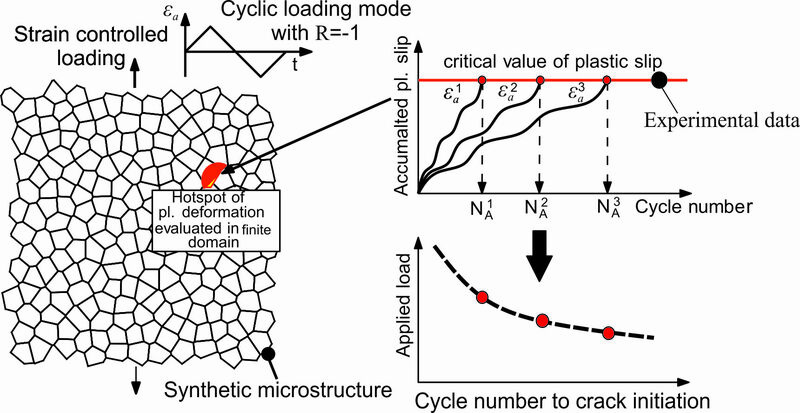 To accomplish this, a model describing the evolution of the particular dislocation structures observed under cyclic plastic deformation is implemented and applied on randomly generated representative microstructures to investigate fatigue crack initiation. Finally, a method is presented to calculate the S–N curve for the polycrystalline materials. With this work, it is demonstrated how the micromechanical modeling can support the understanding of damage and failure mechanisms occurring during fatigue.